Sharing her excitement, Shilpa told IANS: "Anything to do with fitness and somewhere to bring about a change and create awareness on fitness... I will always be there. As I always say that health is important, I will be supportive to anyone who is making choices towards that direction." "When I came at 6 a.m. in the morning, the number of participants which is more than 2,000 people, was more than enough for me to feel excited and be part of the initiative," said the actress. Asked for how long she can hold a plank on a usual day, Shilpa said: "I am capable to hold it for two minutes. Experts say that one can hold for that long if only the person is at his/her fitness best." Nath said: "It was wonderful to witness the enthusiasm and zeal, which was exhibited here today, in setting a new Guinness World Record. 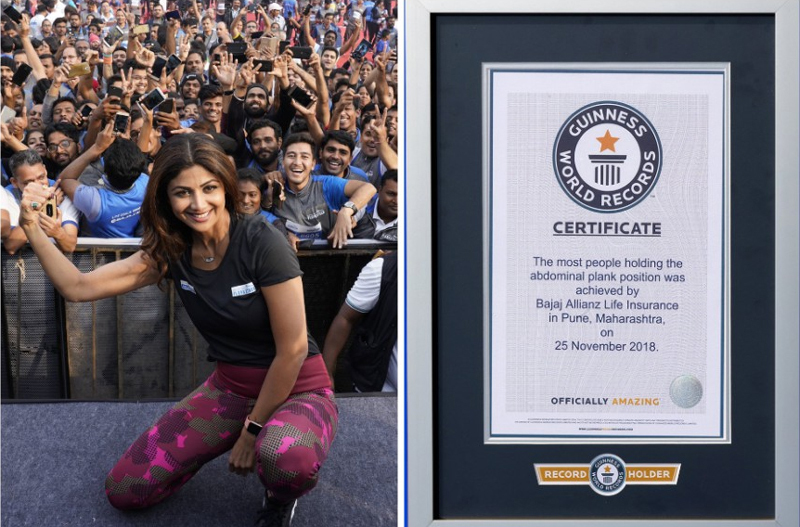 I congratulate the brand on achieving a new benchmark in the category most people holding the abdominal plank position."